Shortlisting a supplier may be your primary objective, but without quality control and import cost management systems in place at the outset, your project will face many challenges, and your import success could be placed in jeopardy. You could lose precious time, money and most importantly brand reputation. We designed our 360° Sourcing Service to help guide, counsel, and protect you in these areas. It’s our most complete, all-encompassing Sourcing QC & Project Management service. 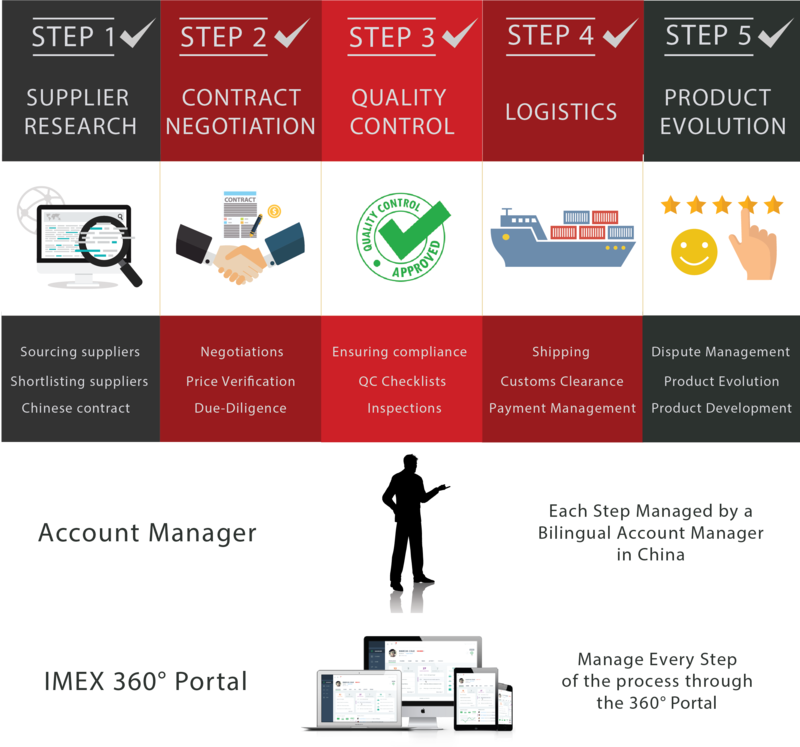 It takes you systematically from sourcing a supplier all the way through to managing customs clearance and logistics – and addresses all the critical points in the process. For countries like the UK, USA, Australia, and Canada, where most of our clients are located, we can deliver the goods right at your doorstep. We manage customs clearance and logistics in China and your destination country. When you use our 360° Sourcing Service, you can focus your efforts on scaling your business using your core expertise and leave your sourcing, QC & supply chain management, our core expertise, to us. When you use our 360° Sourcing Service, you don’t just save time, but you also save money. By cost optimizing for every moving part, by using our bulk discount to get the best prices, and thanks to our bilingual Chinese sourcing team that are tough negotiators, you will see your processes and costs optimized to find the best combination of price & value. Sourcing Suppliers: We source using a wide variety of resources available to our team including our existing database, relationship factories across industries and other channels. We also aim to get the best possible pricing by working with ground level factories that have more competitive prices than suppliers on online platforms many of whom are traders claiming to be factories. Due-Diligence: We carry out due diligence on all suppliers we source using our access to govt. databases and other 3rd parties to ensure we are dealing with a factory (and not a trading company claiming to be a factory) & the factory is reliable and has a manufacturing history. This is a key shortlisting criteria we use during the sourcing phase. Negotiations: We have a Chinese negotiation team with more than 50 years of combined negotiation experience which in most cases allows us to dig factories not easy to find online but more importantly negotiate better terms for – Pricing, payment terms, trade terms & AQL Levels. Inspections: 1 Man day inspection for your goods at the factory by a qualified QC Inspector is included in the 360° Sourcing Service without any additional costs. Additional inspections can be added as required. Price Verification: If you opt to use the 360° Sourcing Service with your own nominated supplier, we can do a market scan to verify if the prices you are getting are consistent with the going market prices for your product and see if we can cut pricing on your existing products so you can get an ROI on the service straight away. We can also carry out the same due-diligence on any supplier you nominate. Ensuring Compliance: We check the various certifications requested by you from the supplier to ensure that they have relevant & “Genuine” certifications for your country. For e.g. verification of CE, ROHS, CSA and other certifications. Chinese Contracts: We sign contracts with the suppliers to ensure various QC clauses are added and there is a clear mechanism for dispute resolution. Being based in China we can also pursue these contracts if things go wrong. Logistics: We can help manage Air freight & Sea freight (LCL & FCL) right to your door in the US or UK including any Amazon FBA Warehouse. We also have some of the best rates for Air courier to any address in the US & UK and were one of the first companies to offer direct courier to FBA warehouses. Managing Payments: We manage the payments so that cost savings can be achieved (for e.g. when paying multiple suppliers) & risks can be managed (i.e. instant payment to suppliers after inspection of goods, so possession of goods can be taken avoiding the risk of “swapping” of goods post inspection). Dispute Management: Managing any disputes with the supplier, especially common issues like getting suppliers to re-work goods once a pre-shipment inspection has failed or if a supplier refuses to comply with contract terms. Product Evolution: With most of our clients we act as a strategic partner, i.e. their China office and our relationship continues post shipment, as the clients send us feedback to help evolve the product over time, based on the reviews and feedback they get from their customers. We work with factories to make improvements to the product as well as continue to find back-up factories where required in order to ensure stable supply and competitive pricing as our clients grow. We have always positioned ourselves as a company that aims to combine technology with sourcing and hence technology has been a core focus for our business. We have always had strong back-end tech but our client portal which eliminates a lot of the time-wasted in back and forth communication and allows clients to get answers to a lot of questions instantly (Without the need to wait for answers due to time zone differences). 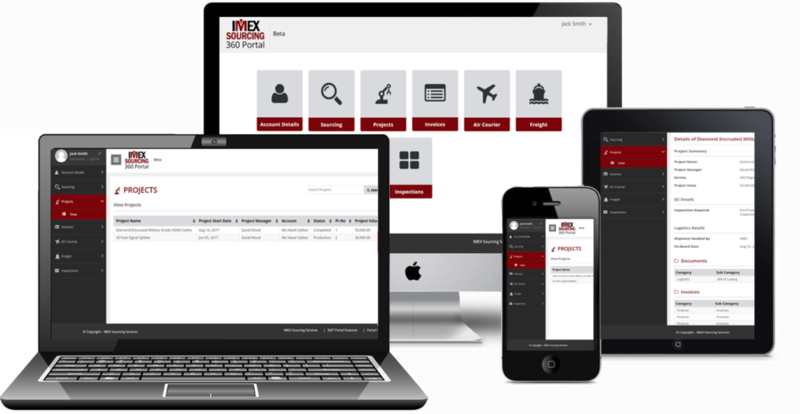 The portal shows status of all sourcing cases, projects, shipments, tracking information, documentation and other features. We work with Mid to High end importers, especially E-Commerce companies and our clients include several multi-million dollar Amazon Sellers. We also work with Crowdfunding Campaigns on sites like Indiegogo & Kickstarter. Please check out out New Product Development Service for more on this. With more than 50 years of Combined sourcing & supply chain management experience we help our clients not only source products, but help them generate cost savings in several ways such as reduced sourcing product costs, reduced returns, early detection of QC issues, time saving as a result of not having to manage suppliers on day to day basis, savings through consolidation of goods and reduced logistics costs. Our knowledge of the manufacturing/importing processes and our presence ‘on the ground’ helps our clients deal with quality issues proactively. We deploy several systems & processes and eliminate and minimize QC issues to begin with. We often help companies & Crowdfunding campaigns with complex products, requiring significant customization and tweaking. Such customization is often aided by having our fully bilingual staff communicating with suppliers. We help our clients develop new products in China through our New Product Development service. For a more detailed understanding of the 360° Sourcing Service and how it could help you, please drop us an email with details of your requirements.